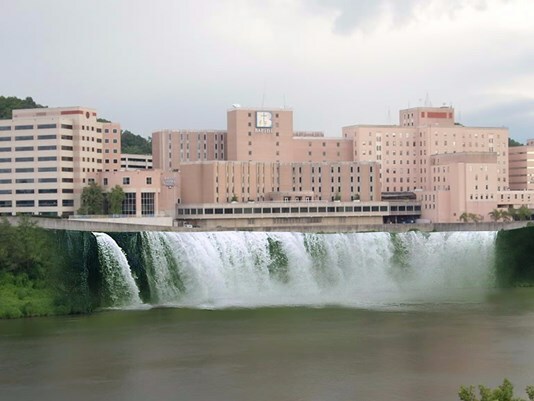 Move over Niagara Falls, Knoxville could be getting its own waterfall. Local businessman Ross Bagwell Sr. is hoping to add a waterfall attraction to the South Knoxville waterfront. Bagwell originally wanted to call the project the "Niagara Falls of the South," but that name was already taken. Bagwell settled on "Knox Falls." In the 1990s, Bagwell started Cinetel Productions, which was once the largest independent cable network program production company in the U.S. He now runs Bagwell Entertainment, LLC. His current plans for Knox Falls would feature a waterfall on the south waterfront and an observation area on the northern side of the Tennessee River. It would also include a water show with lights and music. "One day I was driving and looked down and saw the blank area there, and said 'why aren't we commercializing that? '” Bagwell said. Working with a graphic designer, Bagwell came up with the plan for the south and north sides of the river. "Original music, computerized lighting done professionally and then the overall falls would be timed, so that different pumps would pump water from different areas,” Bagwell said of the proposed site. Bagwell said that the project is still in the idea phase, but he wants to bring it to the city soon. When 10News reached out to the city for comment, a spokesperson said they haven't seen or received any waterfall proposal or suggestion. “From the image that was forwarded to me . . . is a privately owned property in the midst of a privately-owned development, so any proposal there would have to come from the developer,” city spokesman Jesse Mayshark said. Mayshark also noted that any kind of development with water flowing into the Tennessee River would require the Tennessee Valley Authority to get involved because it's their jurisdiction. There's no word on how much a project like this would cost or how long it would take to create. Bagwell believes it could be an attraction that leads to a big tourism boom for Knoxville and the surrounding area.